Having a roommate may seem fun if you are staying with any of your friends but living with someone you don’t know is not as easy as one may think, despite the compatibility. People have different mindsets which result in differences and problems. 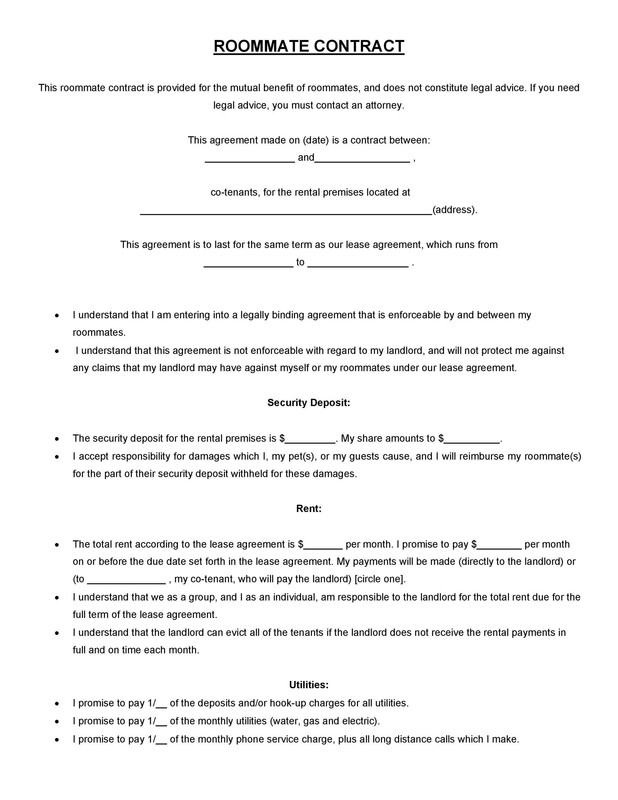 They can make a lot of informal agreements such as occupying bedrooms, splitting rent and sharing chores to name a few. Such things do not bother your landlord and they have no power to enforce them; it is you who are the one facing it. Thus, it is always better to make arrangements and agreements beforehand to avoid problems in the future. 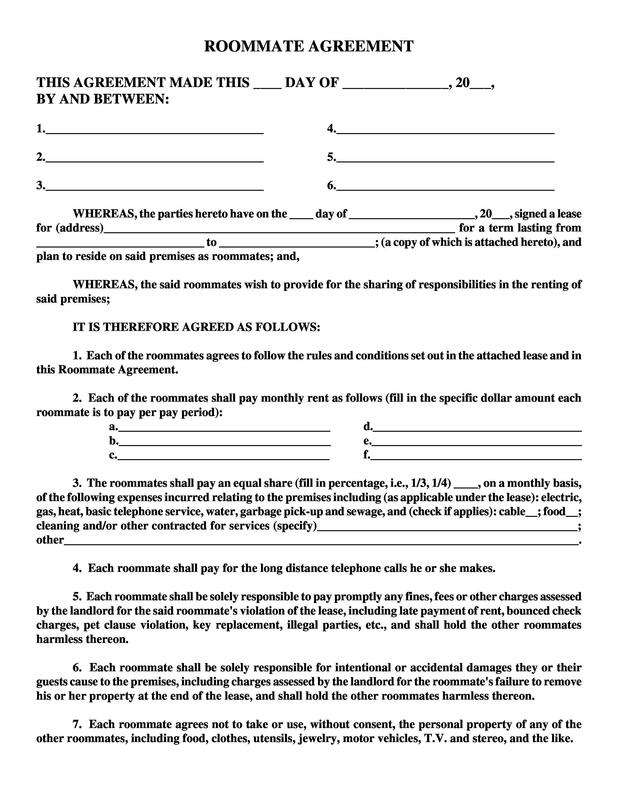 2 What is a Roommate Contract? 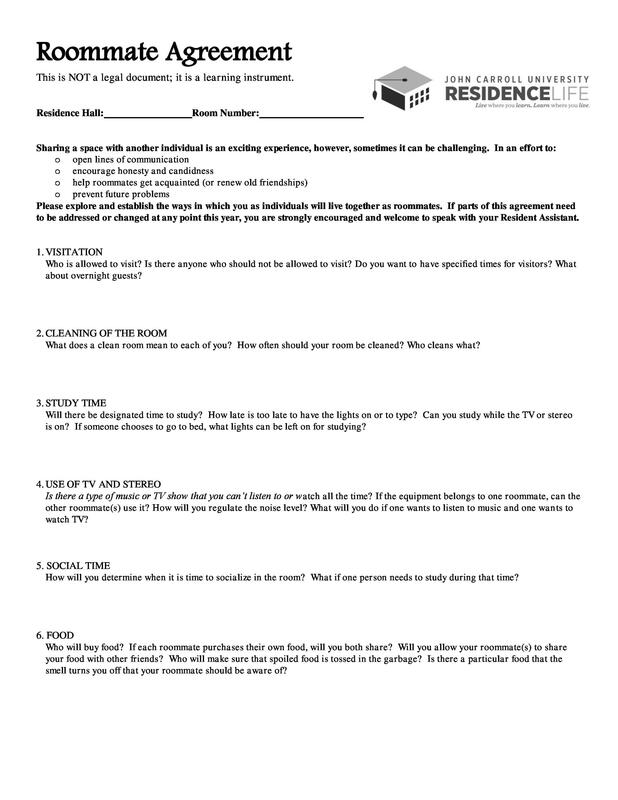 4 What are the Things you Need to Keep in Focus before Making a Roommate Agreement? 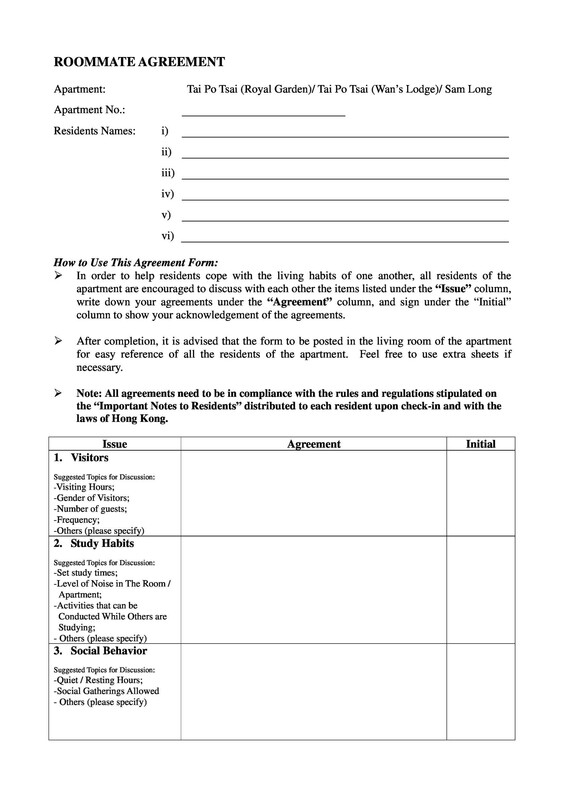 6 How to Make a Roommate Agreement Form? 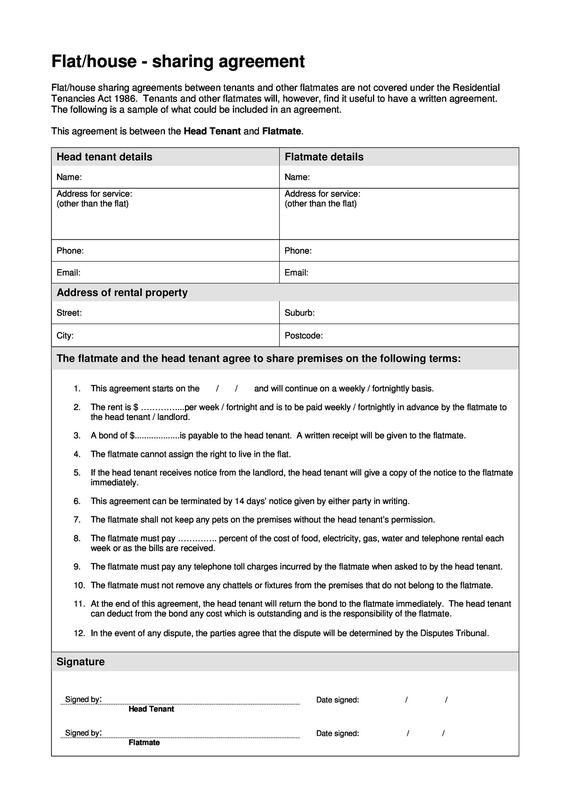 If we break it down further, we often see people not forming this agreement and think that only the lease agreement is good to go in order to maintain harmony between the tenants. This is where they are mistaken. 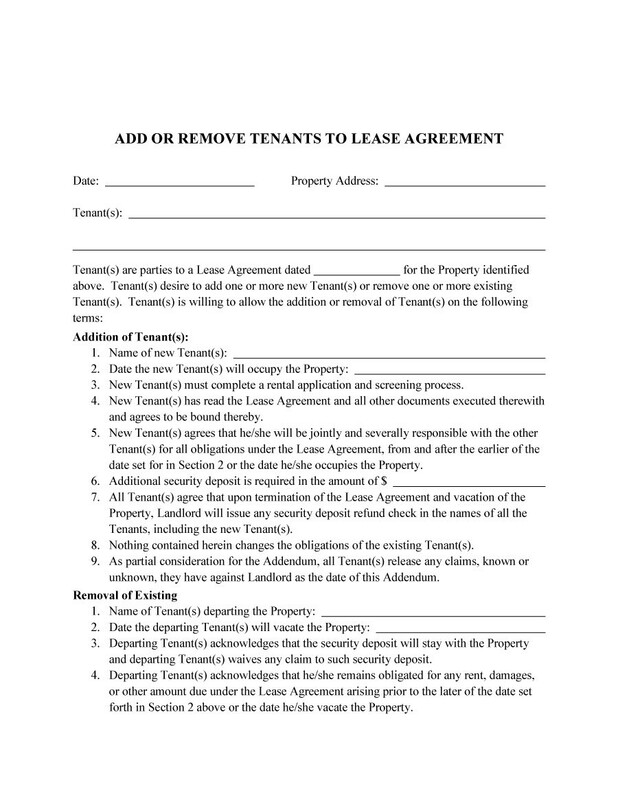 Both of these agreements have their own individual purposes; a lease agreement only elaborates about the legal relationship between the landlord and the tenants as a whole and not the relationship between the individual tenants. For instance, your lease requires you to pay a certain amount of rental payment; it does not discuss the way in which the amount of rent should be divided among the roommates. 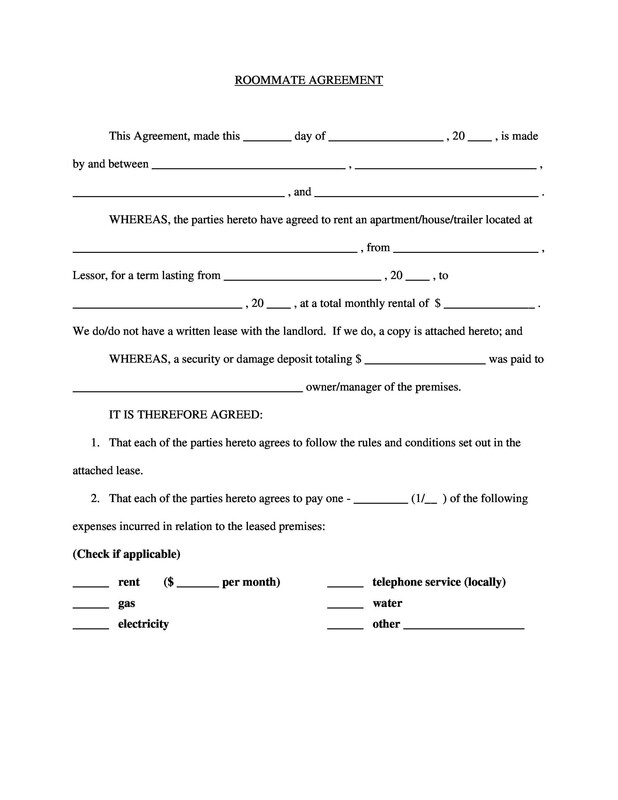 Moreover, the lease agreement does not decide the behavior of the roommates towards each other. 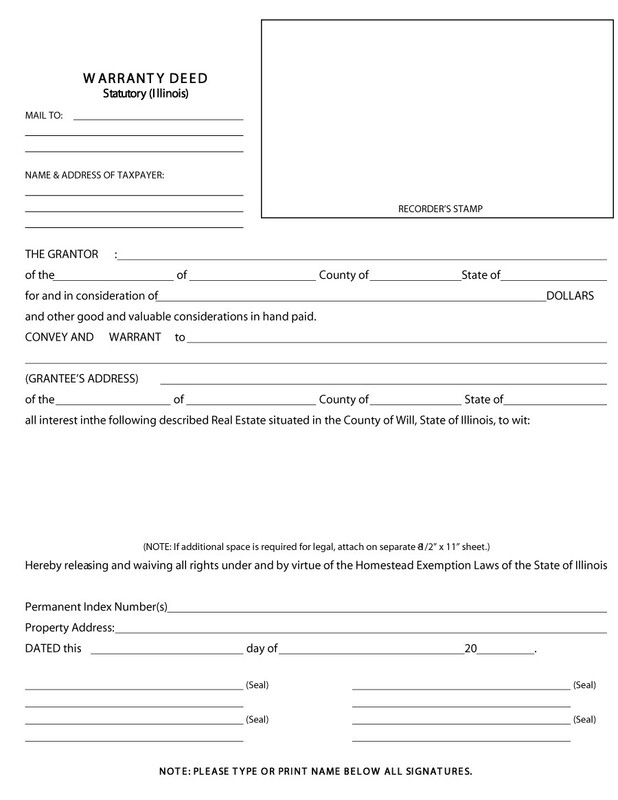 Since the behavior of the tenants does not violate the law, roommates are free to do anything. Imagine your roommate walking in with their friend for a night stay and that overnight stay turns them into a permanent guest at your apartment. They might start sharing your things, space and other utilities. In addition to that, it is likely that your roommate can leave the apartment and never return, leaving you to pay the rent. These problems can really frustrate and piss you off if you are in the right at your end. For this reason, a roommate agreement assists you with all these matters. 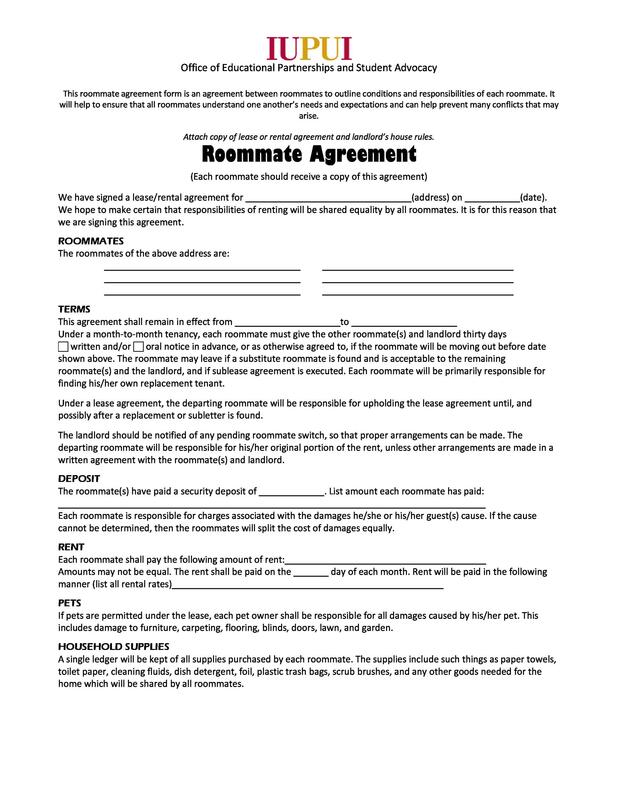 From deciding the rules to what should be done in case of disagreement to the breach of contract by any of the roommates, the roommate contract decides everything. 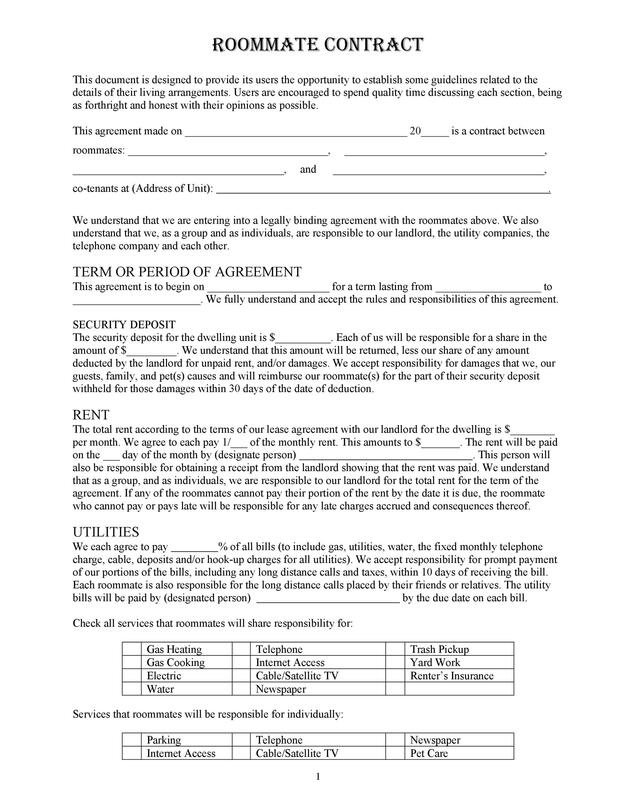 When you form this agreement, you must keep in mind that it is only between the roommates and it does not bind your landlord. 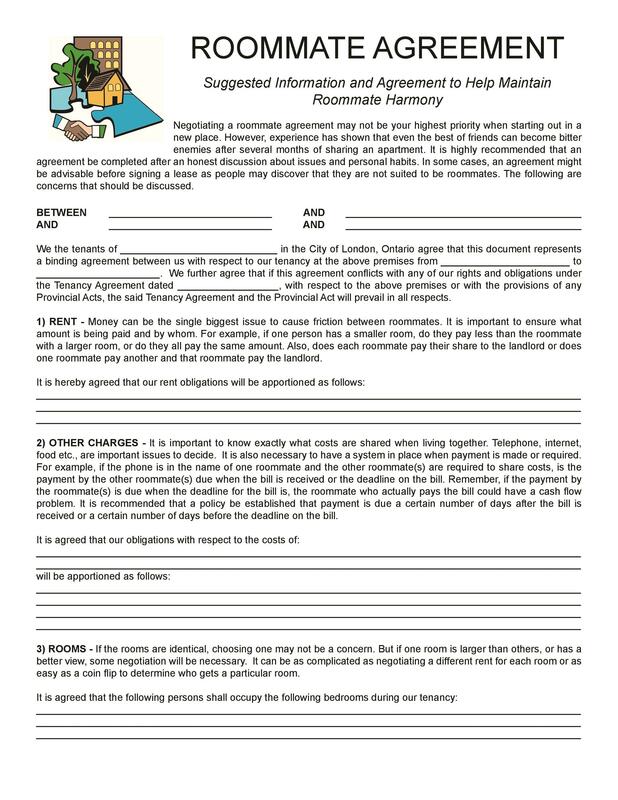 If you are also sharing a room with someone else and have not formed a roommate contract, then you need to formulate one soon. 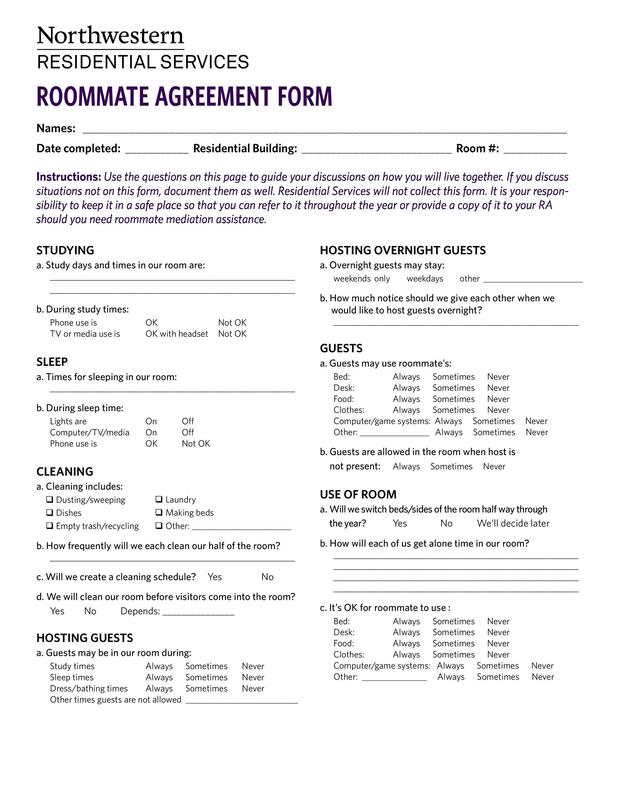 Here’s all you need to know about making a roommate agreement template. 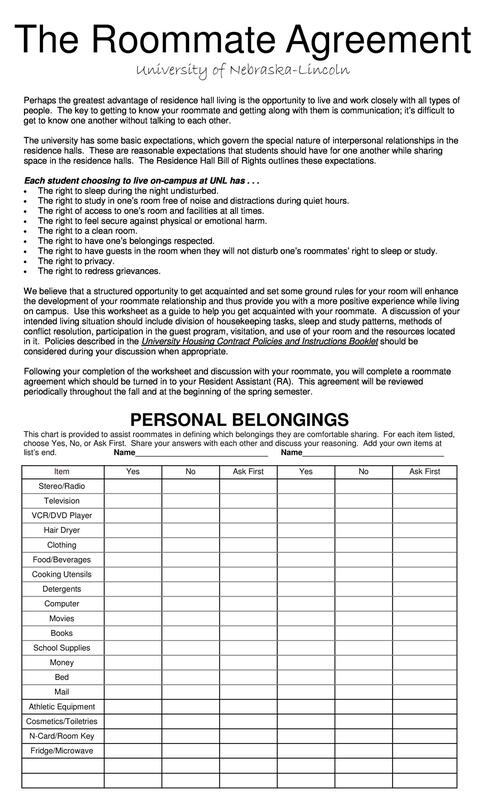 What is a Roommate Contract? 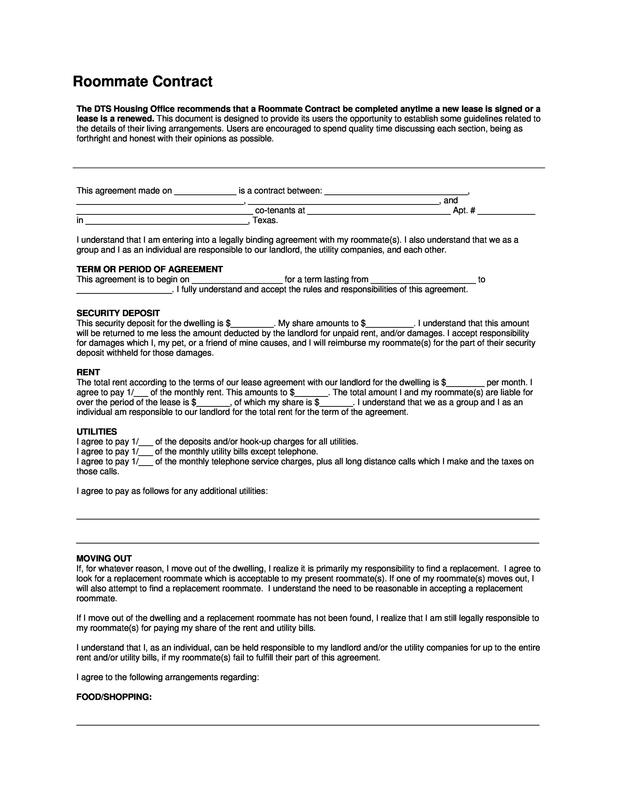 Before we thrust into the details of forming a roommate agreement form, let’s understand what a roommate contract really is. 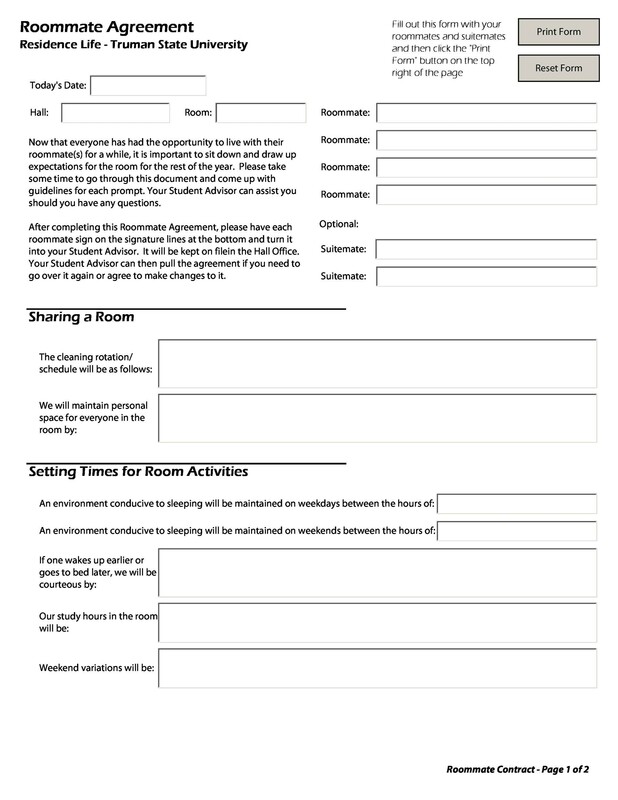 It is a written agreement that permits you and your roommate to negotiate different sets of rules that you both have to follow throughout the year in order to prevent potential conflicts. 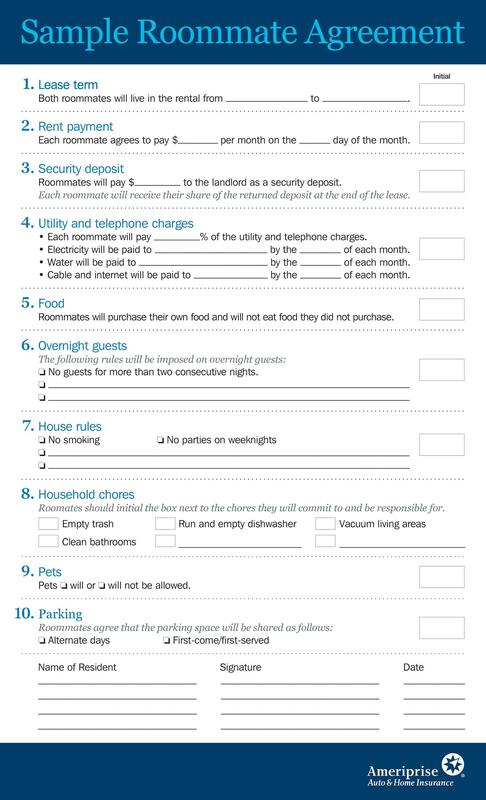 The common features of a roommate contract include moving out, noise, overnight guests, household chores, space, rent and food sharing to name a few. 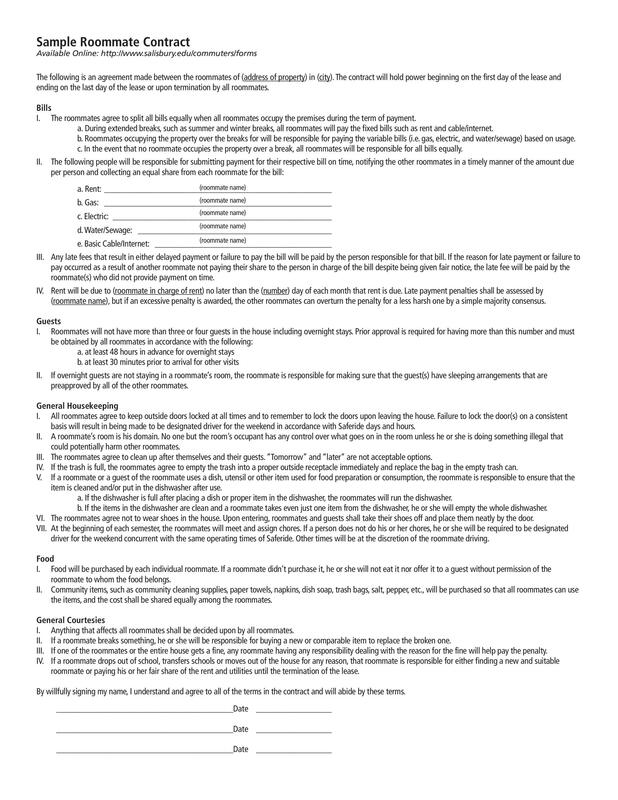 We will further discuss the kind of elements that you need to add in the contract in detail below. More than two people can share rooms and hence, a contract must be formed among all of them. Also, everyone must be given a chance to speak and voice out their concerns if they find any rule inappropriate. 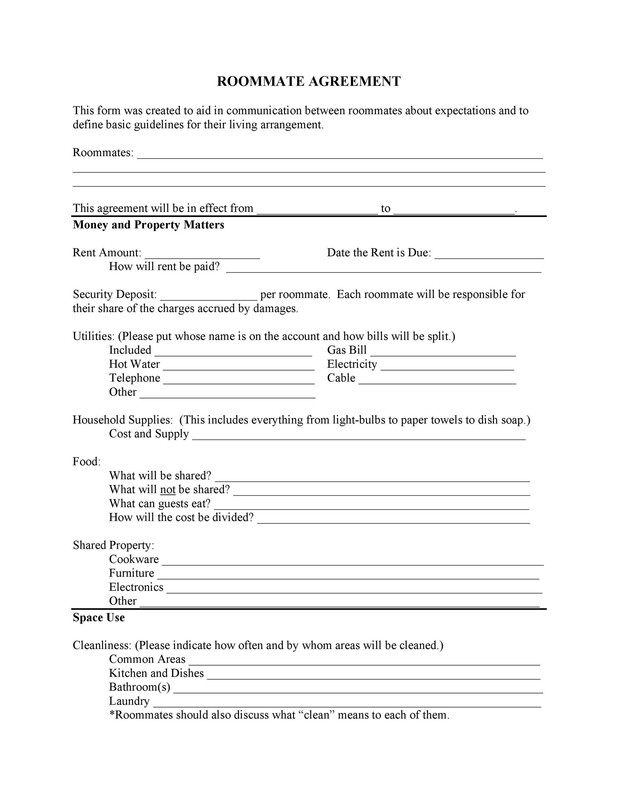 The things that you have to include in the roommate agreement form depend entirely upon you and your roommates, from the look of the contract and all elements that you want to include. If you are confused and think that these legalities should be discussed in front of a legal authority, then you should hire an attorney. They can help you formulate all the rules and the entire agreement seamlessly. Also, there won’t be any chances of biasness or having your problems go unheard; everything will be decided based on the mutual agreement. 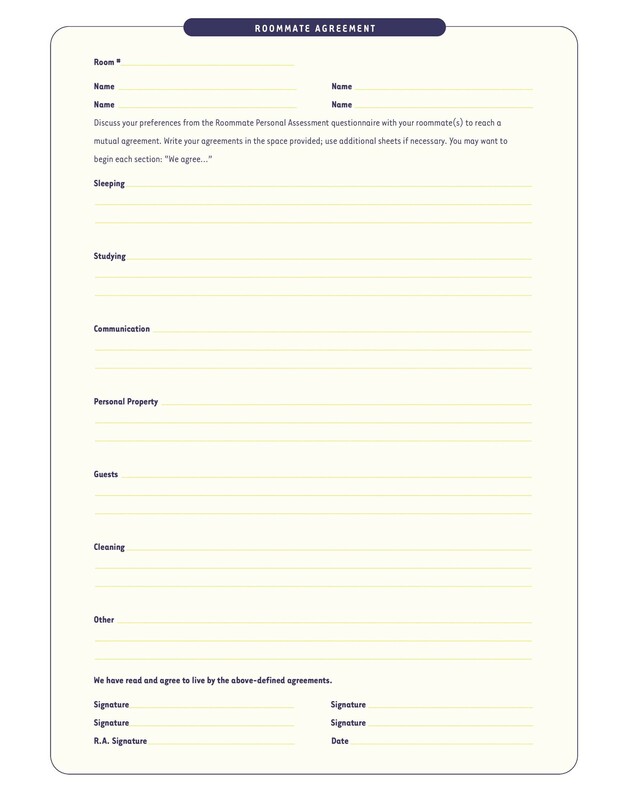 However, if you still think you should discuss it with someone else before involving an attorney, then you can check out the templates available online. 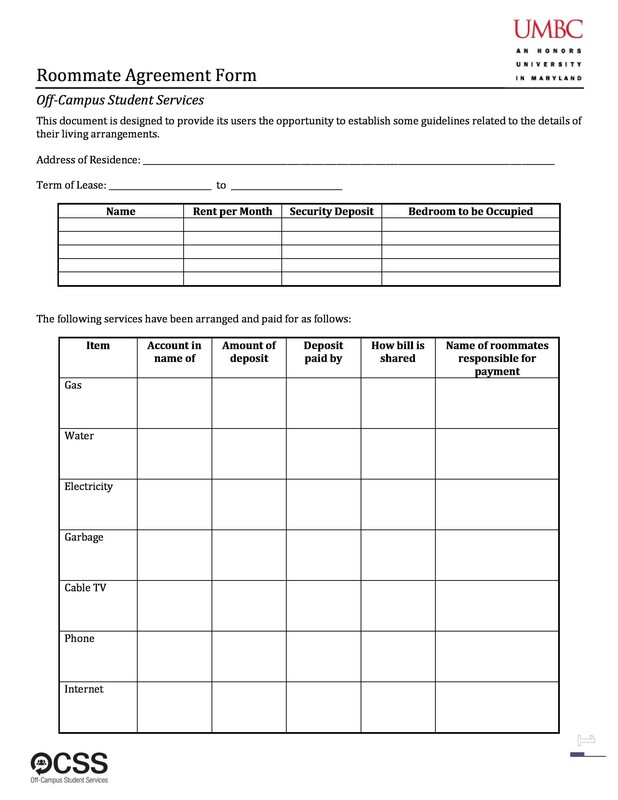 Templates will give you a clear idea as to what you should include in and exclude from the roommate contract. 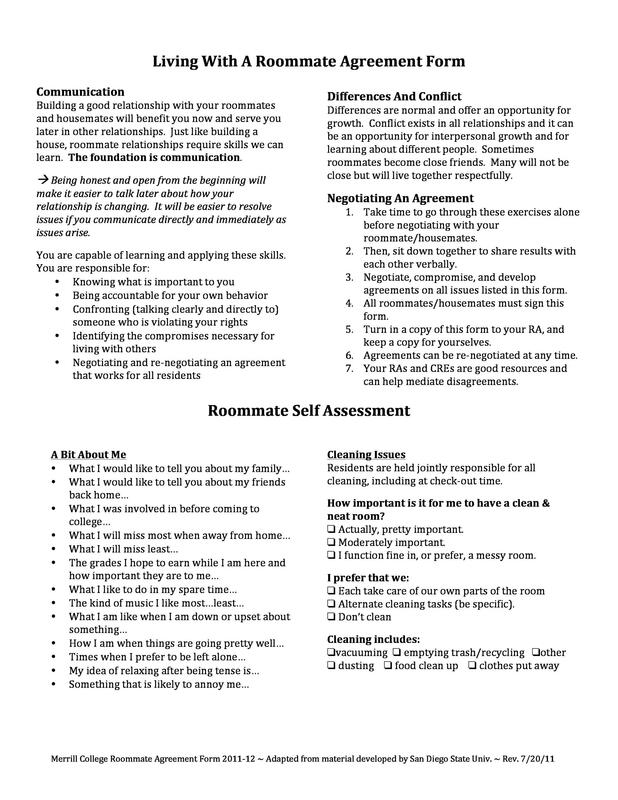 What are the Things you Need to Keep in Focus before Making a Roommate Agreement? 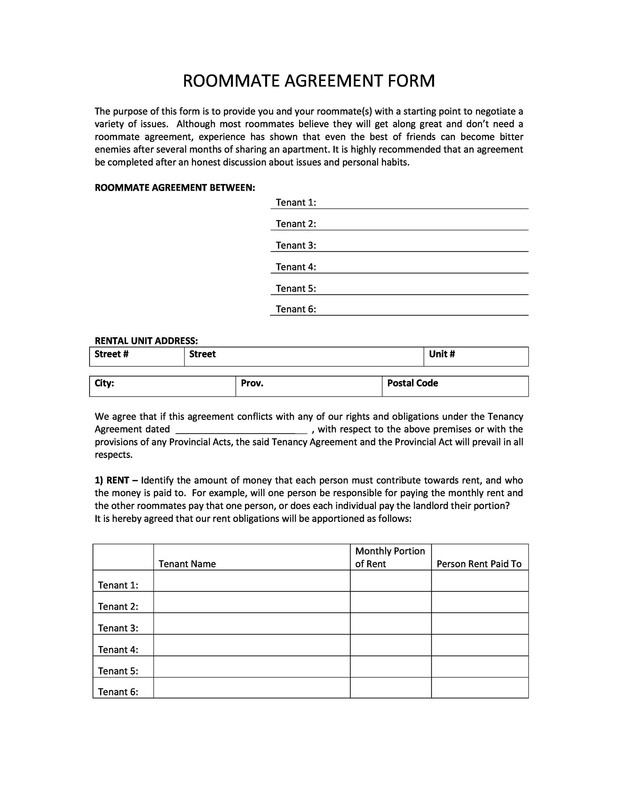 Before drafting your roommate agreement, it is important for both of you to understand the difference between a lease and a roommate contract. 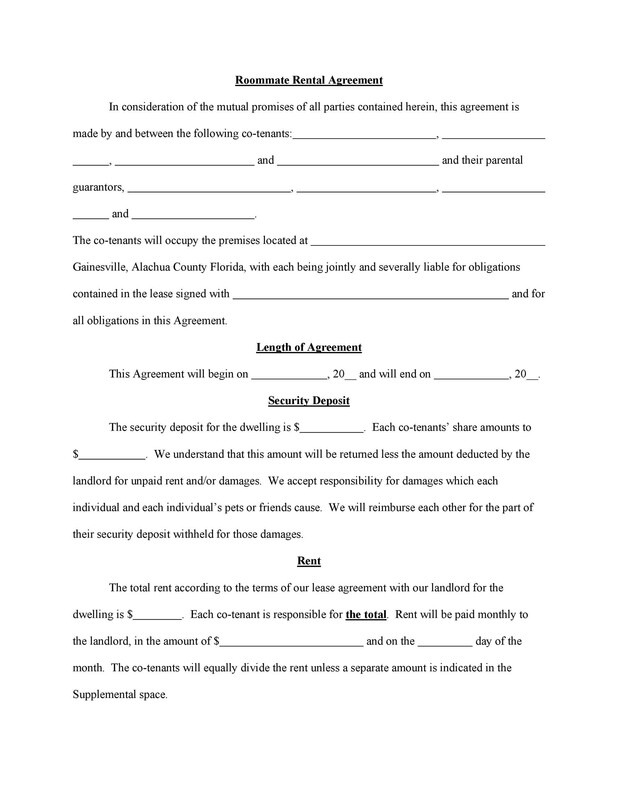 A lease contract is an agreement between the landlord and the tenants, while the roommate agreement is a legal document that binds the individual tenants who agree on several terms of living with each other. 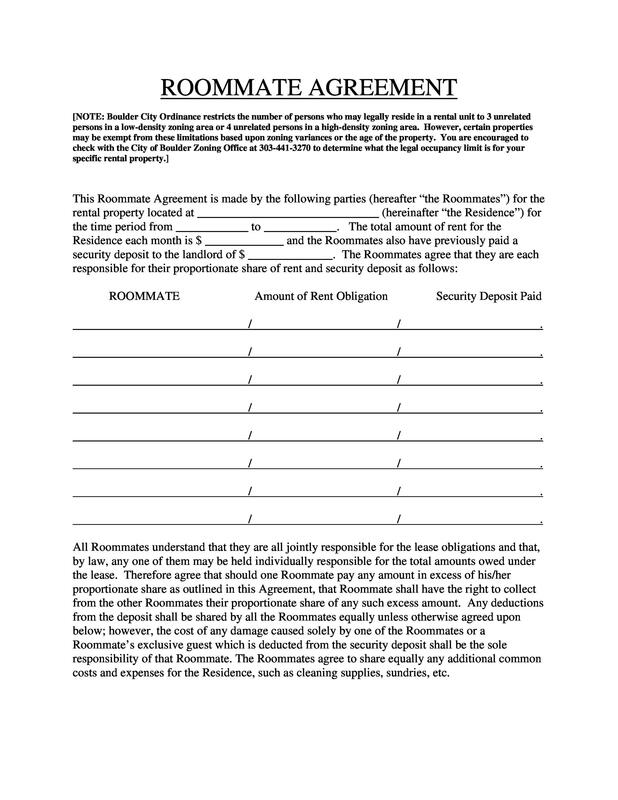 Moreover, the roommate contract prevents future disputes and only bounds you and your roommates. 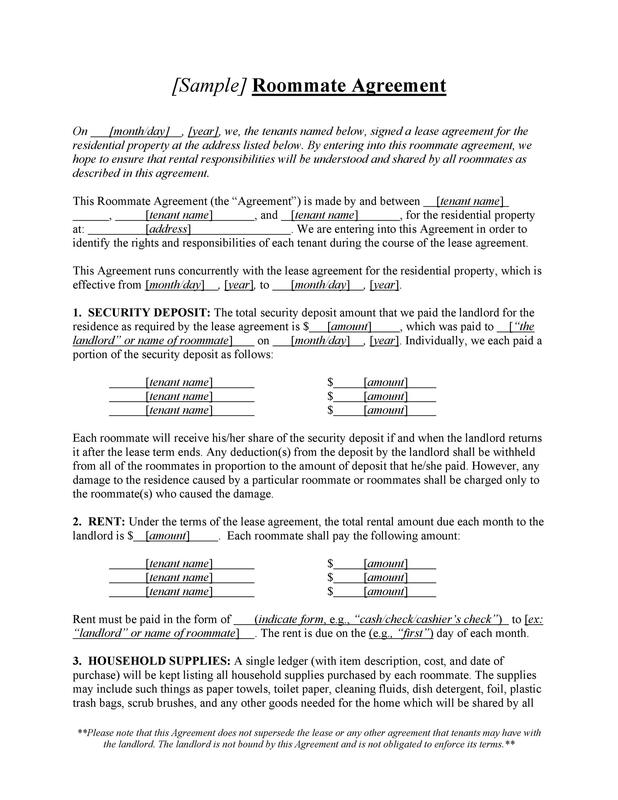 On the contrary, a lease document only bounds your landlord and individual tenant and they have nothing to do with the roommate agreement. When you form an agreement, you need to understand its terms and conditions properly and make sure that they are in good faith. The contract ensures making your living conditions easier and clearer. Before drafting it, both of you need to agree upon making it and even the terms and conditions mentioned in it. Both of you cannot violate it, especially when you have involved an attorney in the process. In addition to that, in case of any dispute, you should resolve the matter by sitting together. 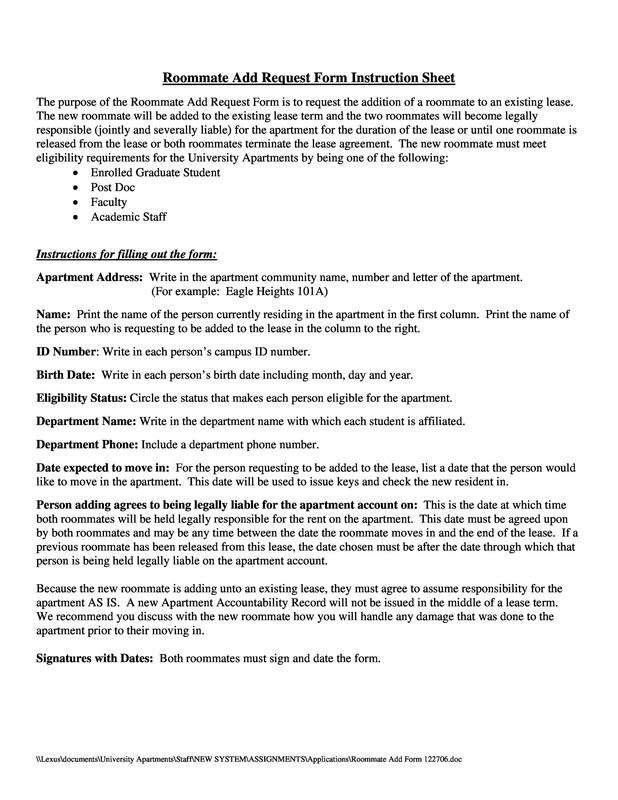 How to Make a Roommate Agreement Form? 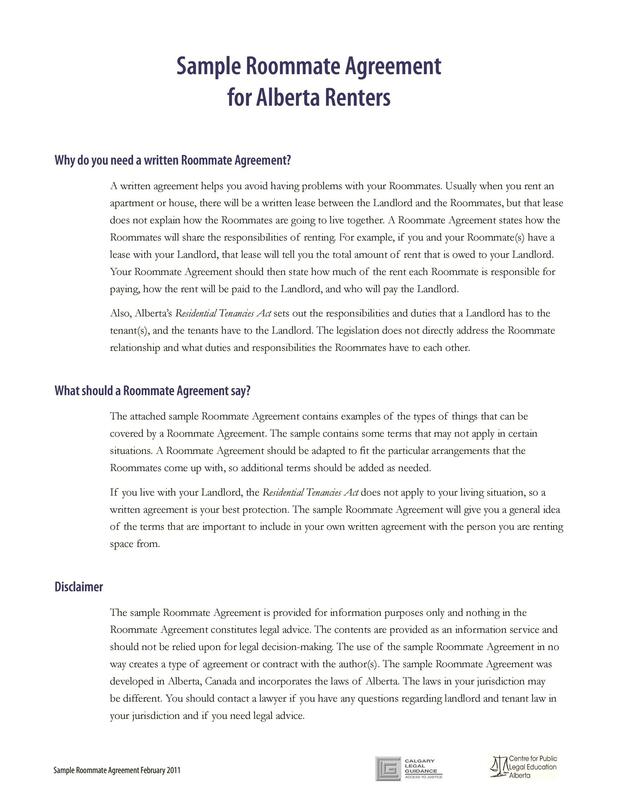 Now that you have understood that there is a difference between a lease and roommate agreement and what you need to do before forming a contract, let’s have a look at the steps to forming a roommate agreement and what is involved in its template. 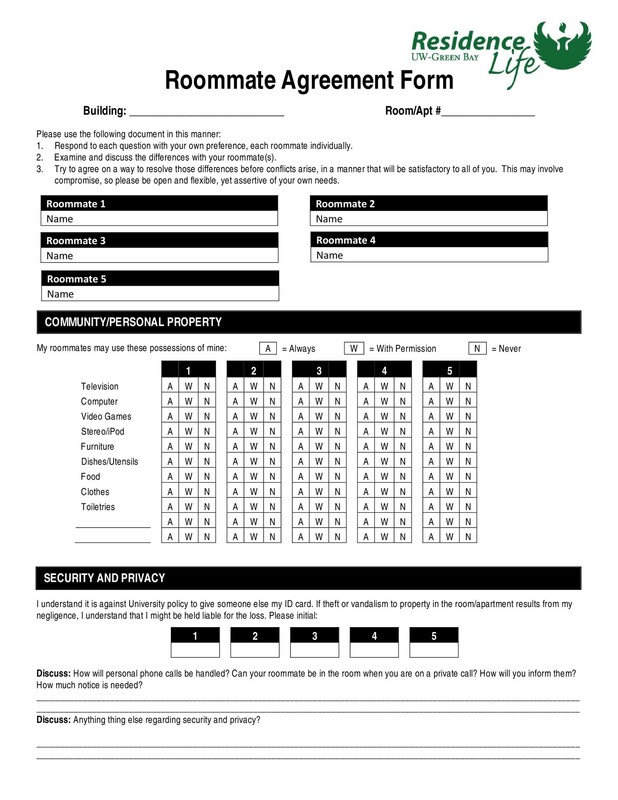 The first step in forming a roommate agreement template is to put your basic information in the form. 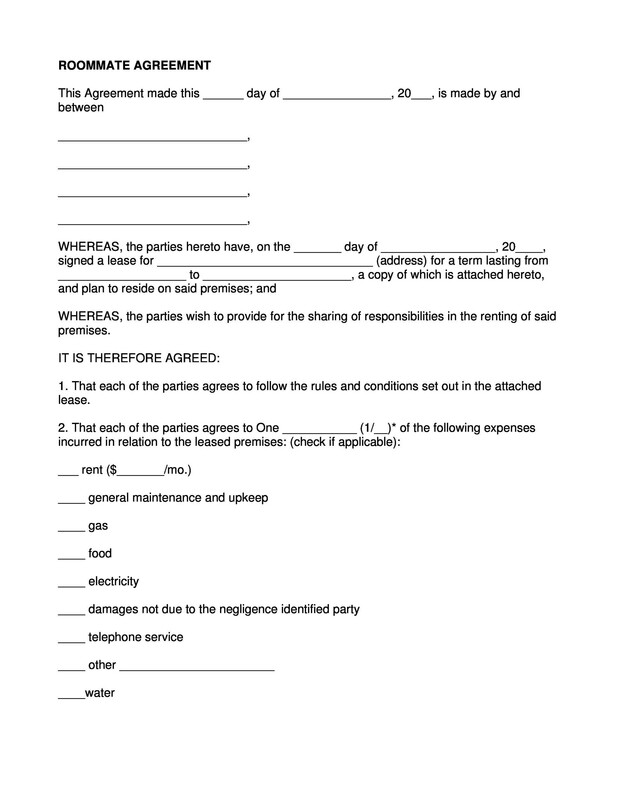 To begin with the agreement, you need to write the full, legal names of the roommates along with the complete addresses of their residence. The address must also include the unit number of the apartments in case a person is living in an apartment. 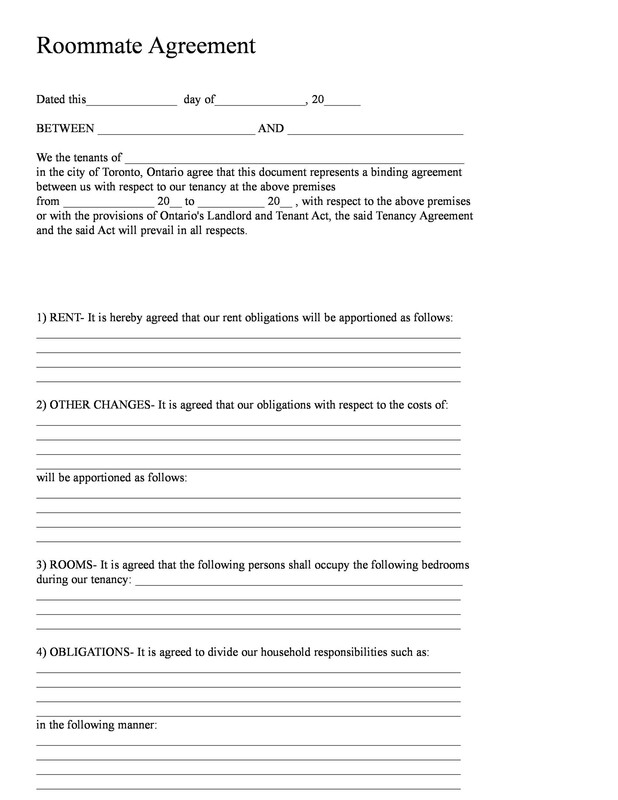 The purpose of the agreement will define the power, rights and obligations between the roommates. You need clearly state the purpose of the agreement so that there are no conflicts in the future. 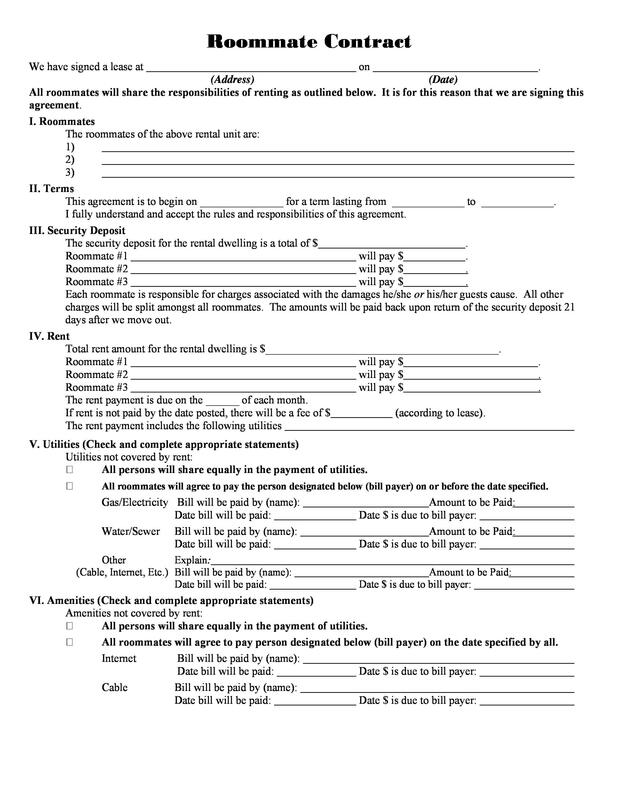 Generally, the purpose of the agreement is the same for roommate contracts sharing equal rights and obligations and there are only a few who have some different reasons. 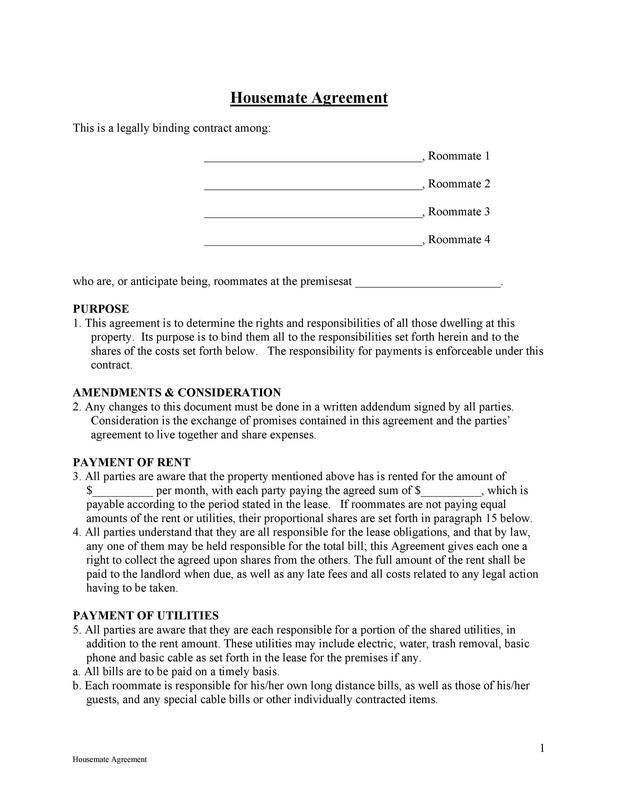 This is the step where roommates need to choose which law will contribute and support the agreement. This section clearly elaborates on the court in the state that will be responsible to act on the contract. You need to put the court of your state in this step. Also, it is better if you take guidance from your attorney in this regard. Now you need to draft the rules for your living, such as the rent. The rule of thumb in this situation is that you should divide the rent equally as that would be simpler for you, as well your roommate(s). You need to specific about the exact amount of rent that the roommates will have to pay every month. This amount is generally the equal division of the total rent the roommates are accountable to pay. 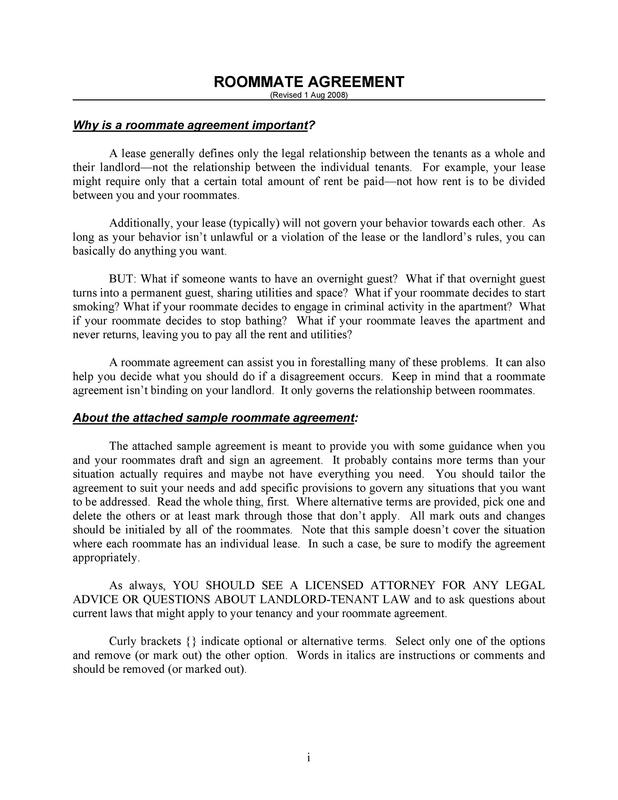 However, there are cases when roommates agree to a different arrangement depending on the factors. For instance, if your room is bigger than the room your roommate is living in, you might have to pay more rent than your roommate who is living in the smaller room. 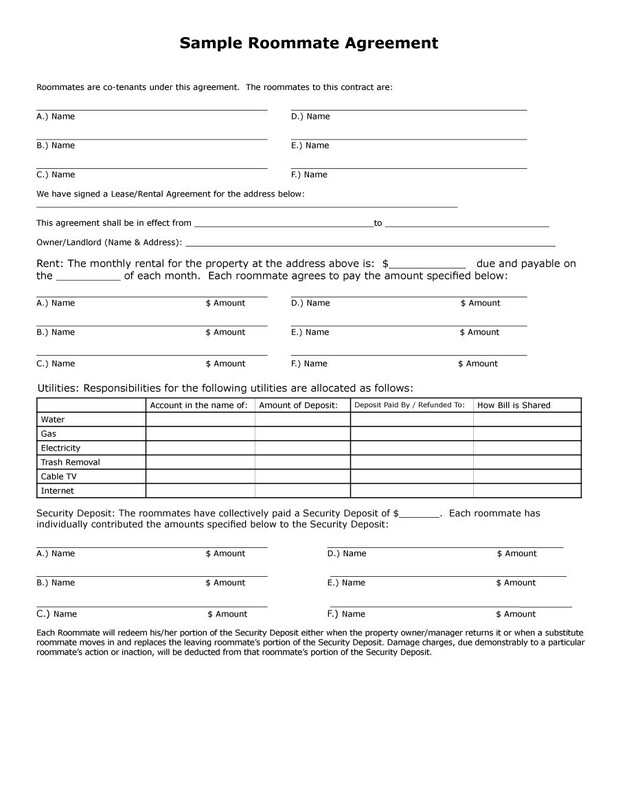 In this section, you should clearly mention the amount of payment of rent that each roommate has to pay for the one year lease. When the amount of rent is decided, there should be no confusion at the end of the month. 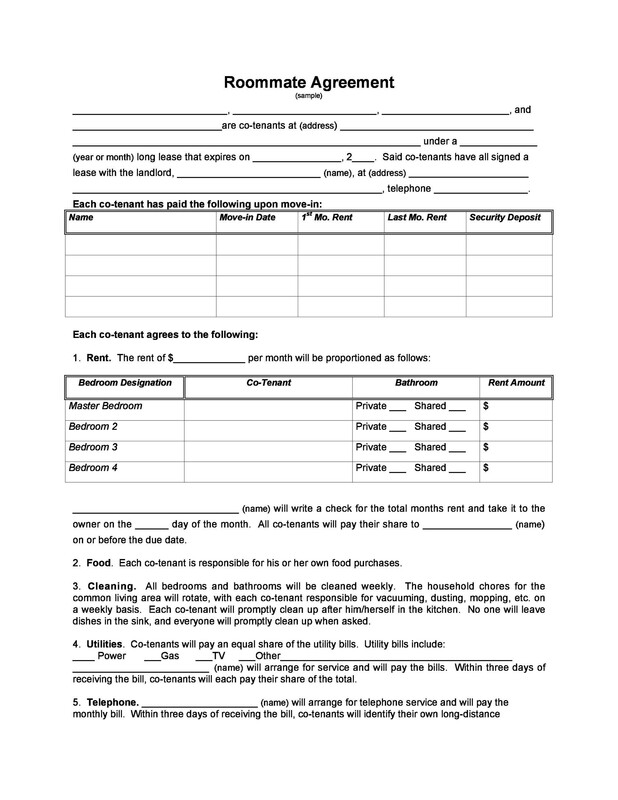 Moreover, you also need to include a note about the security deposit of the residence. 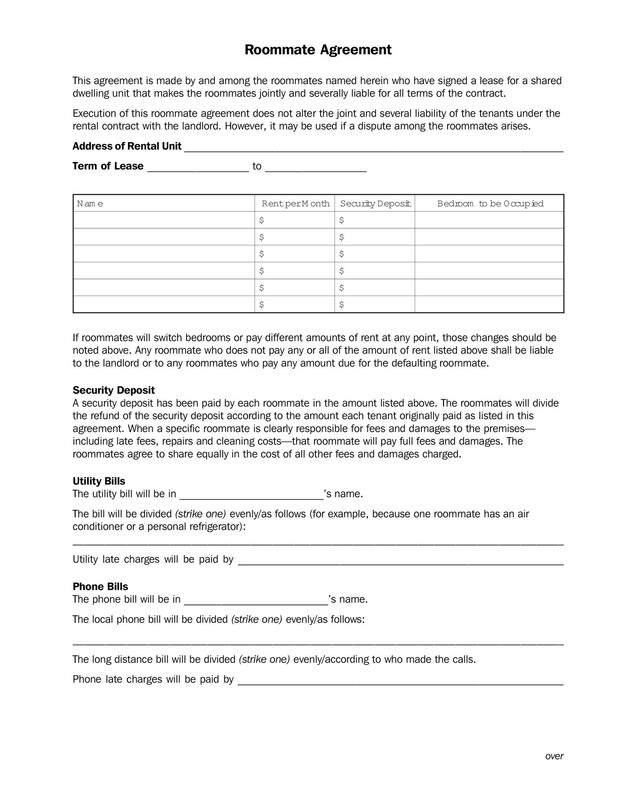 Notes ensure about the ease of division of security deposits once roommates move out of the residence. Now it is time to decide and make a settlement for the household chores, including cleaning. 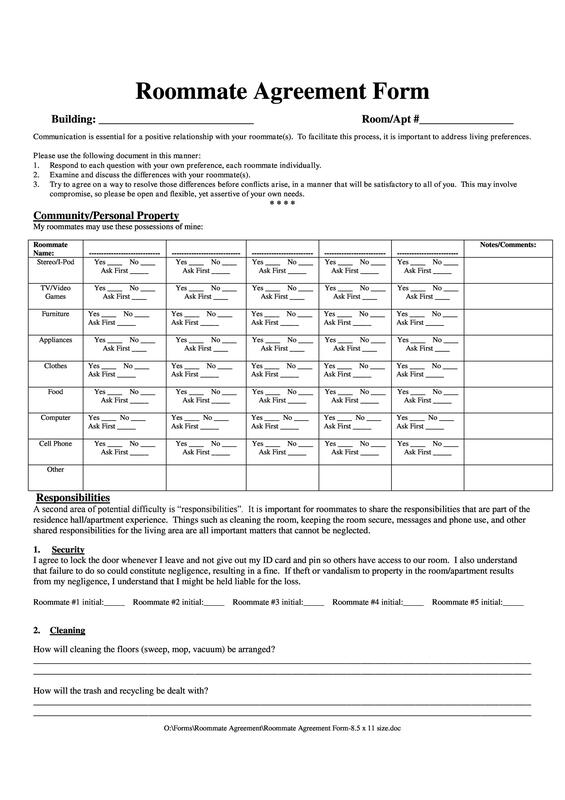 In this step, you have to make a list of everything that is involved in household chores that is required in a resident. Most of the chores are usually shared in spaces such as the bathroom and the kitchen. What if your roommate invites one of their friends and they become a permanent guest? Will that be acceptable to you? 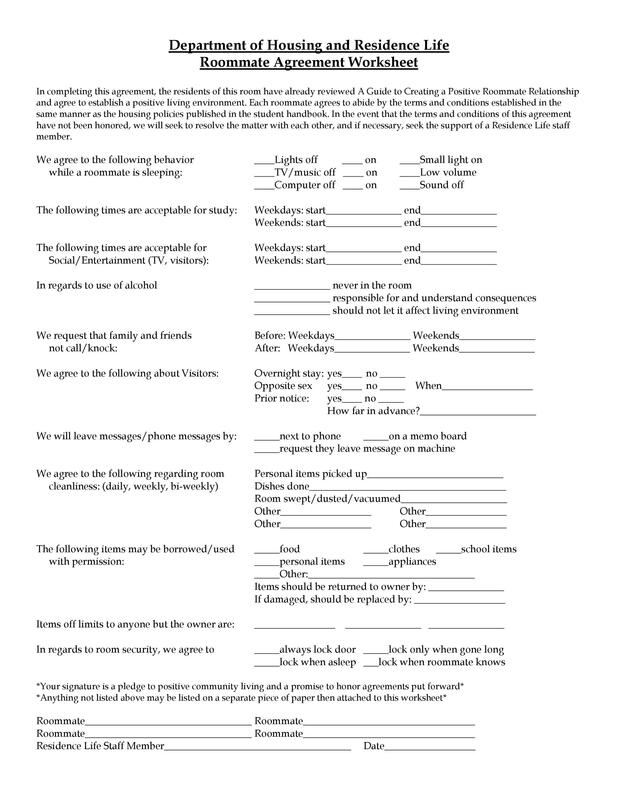 Well, then you need to discuss these things with your room partner in detail, in the policy for guests section. 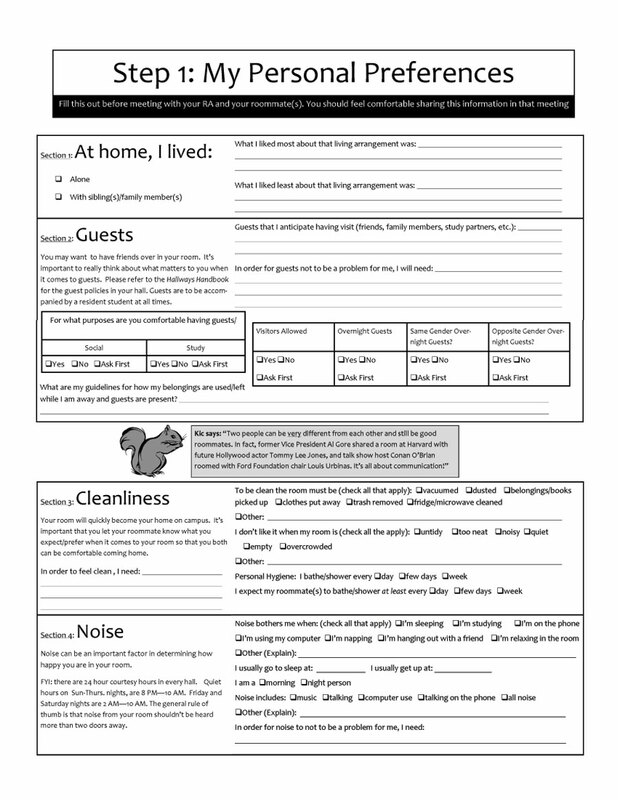 You have to agree upon different sets of rules for visiting guests and overnight guests. According to research, this is often the biggest type of conflict that occurs among roommates. Obviously, no one likes compromising on their privacy. 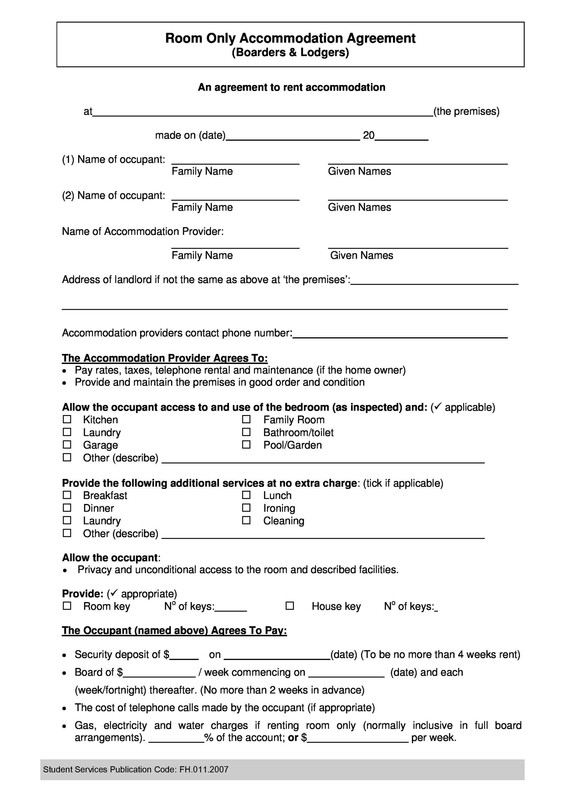 At times, there are some visiting guests who wish to stay at your apartment; thus, you should include a note highlighting for how long they can stay at your place. So, in this section, you should settle and negotiate the guest policy in advance. If you are a pet lover, then you need to consider this. Often, people dislike keeping pets because they cause them allergies. On the contrary, there are roommates who love keeping pets but then, you have to clean the mess your pets make. Both of you will be responsible to clean your house for your respective pets when you share a common space. 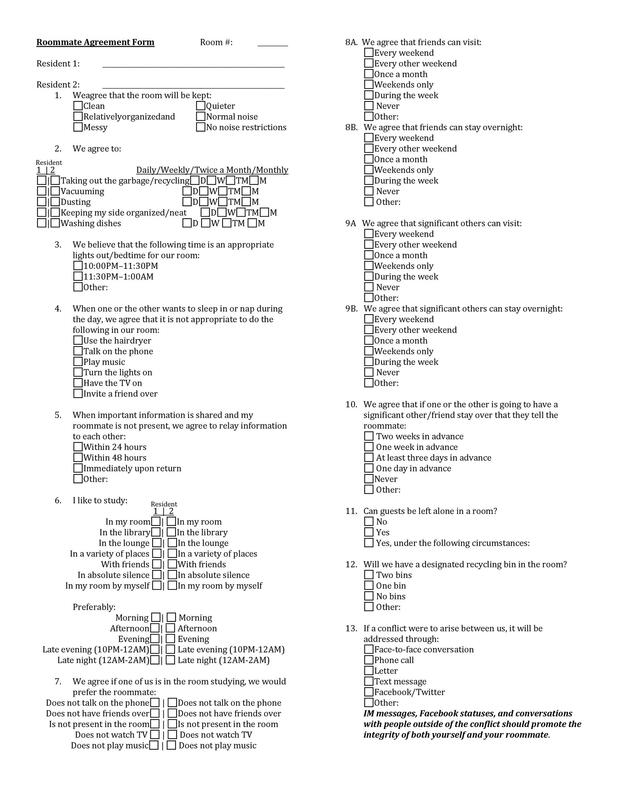 What if your roommate has problems with your smoking and consumption of alcohol? Then, in this case, you need to specify if drinking or smoking is permitted within the apartment. Remember, most of the landlords do not allow smoking and often ask for a security deposit if they find you doing so. Also, you must set rules for the use of alcohol if you party at your residence. 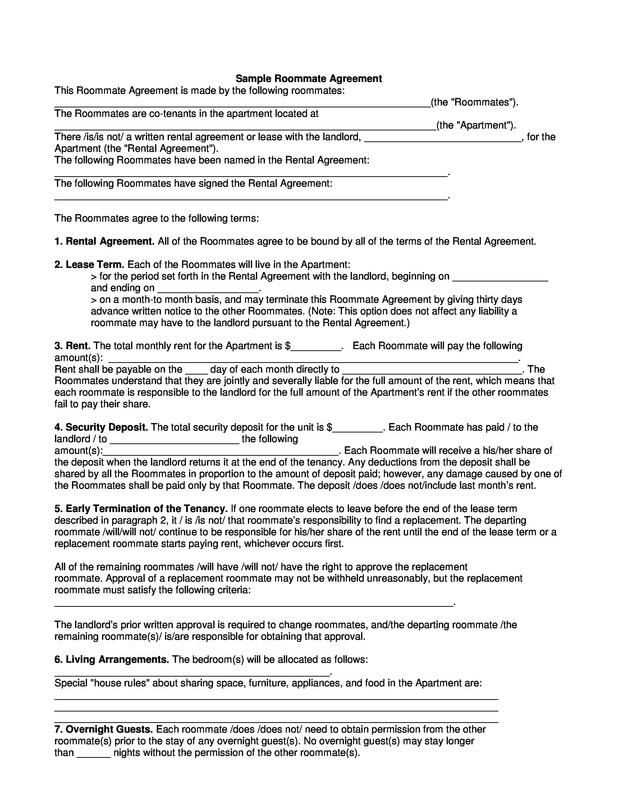 Since you have drawn upon the agreement, it is time to read the agreement in front of all the roommates loudly. Upon agreeing to every rule, you all should sign it to ensure that you all agree to the set of rules being laid in it and that they have been devised with mutual understanding. 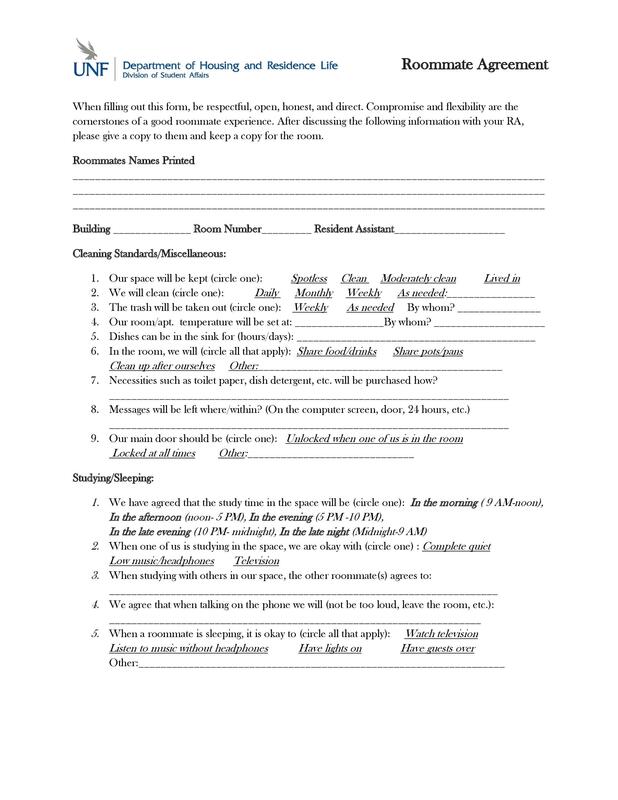 Now that you know about all about a roommate contract and template, we are sure that you must be well versed about it. 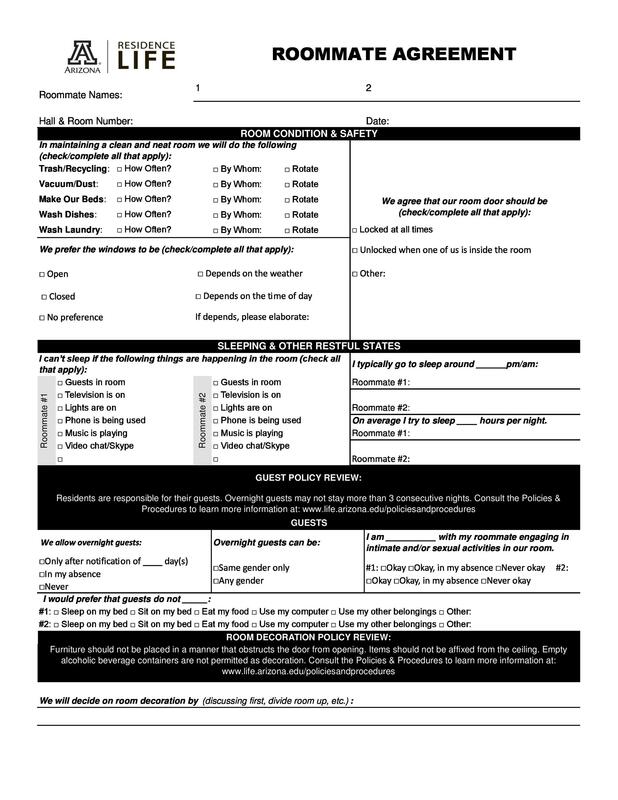 If you are also sharing an apartment with a roommate, then you can download the updated roommate agreement template from our website to avoid possible future conflicts.